The ceremony was duly carried out by the Provincial Grand Master of Inverness-shire, Brother John MacPherson Grant. The first Master of the new Lodge St Kilda 881 was Brother Andrew Gillanders, one of the signatories of the petition of 22nd April. During the next 14 years Lodge St Kilda held meetings in a number of locations within Portree whilst funding for a Masonic Hall and Temple was sought. When that funding was in place the site of the building virtually chose itself. There was a vacant plot on the north side of Somerled Square in Portree next to the Church and through the middle of that plot ran a small stream, or burn, that was known as the Kilda burn, though referred to locally as the ‘Dirty Well’. This plot was acquired and building work commenced. On 11th October 1912 a special meeting of the Lodge took place at the Gathering Hall in Portree. 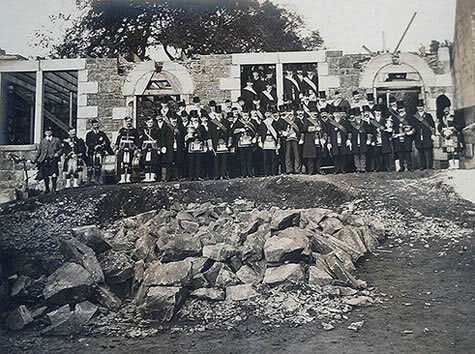 This was the ceremony of consecration of the Lodge Hall and Temple and was presided over by Brother John MacKay, the, by then, Provincial Grand Master of Inverness-shire. After this ceremony the Provincial Grand Master oversaw the laying of the cornerstone. A photograph of the assembly was then taken to record the event. Welcome to the website of Lodge St Kilda No. 881 on the roll of the Grand Lodge of Scotland.